HOT DEALS: Sevenoaks extends Awards special offers to November 21st | What Hi-Fi? Good news! Sevenoaks Sound & Vision has decided to extend its range of 7-day Special Offers on some of our Award winners until November 21st. The promotion was originally due to end last Saturday, November 14th, but has now been extended for another week. Deals include £50 off the Sony STR-DA5400ES (pictured), down from £1349 to £1299, and the Sony STR-DH800 is now reduced to £279. There's £20 off the Sony BDP-S360 Blu-ray player, discounted from £159 to £139. Sony's BDP-S760, our 2009 Blu-ray player Product of the Year, is down £20 to £349. There are also savings on the Samsung BD-P1580 and Panasonic DMP-BD60 Blu-ray players, which are now £119 and £159 respectively. Free five-year guarantees are offered with the Philips 42PFL9664 (our 2009 TV Product of the Year) and 47PFL9664 TVs, as well as the Panasonic TX-L32V10B and TX-L37V10B, while the Philips 32PFL7404 is now available for £569. 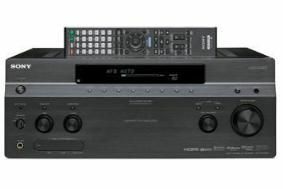 There's a string of discounts on Denon kit, including the DVD-2500BT (£439), DVD-3800BD (£729) and the AVR-3310 (£979). On the hi-fi front, the Award-winning combo of Marantz CD6003 CD player, PM6003 amp and Wharfedale Diamond 10.1 speakers is now £599, a saving of £50. Denon's TU-1800DAB tuner is yours for £189 and the D-M37 micro system (without speakers) is now £195. And the Arcam Solo Mini with Diamond 10.1 speakers can be yours for £749, down from £779. All these deals are available in Sevenoaks stores (not online) until 21st November 2009, so call into your local branch and quote 'Web 7-Day Special' to qualify for the discount. Not available in conjunction with any other offer.